For the 30th anniversary of the original live broadcast, PBS presents an exclusive recording From The Vault of Victorian guitarist Christopher Wood. Chris lives in Gippsland, teaching and performing, and is now working on a new album. 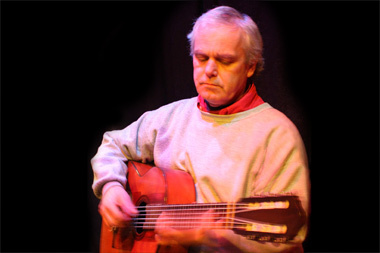 Over many years he's nurtured a distinctive guitar style that draws on elements of flamenco, indian and western classical idioms, in a discipline of structured improvisation around original compositions. This recording was made in Studio 2 during a live-to-air performance on Tuesday 23rd August 1988 between 10pm and midnight, when PBS was still resident in the Park Lake Building in St. Kilda. The program was 'Of Ambience and Atmosphere', which had a fluid roster of announcers from week to week, not uncommon for PBS at the time. Chris had recently released his first LP "Guitarist", and he played several pieces from it for this broadcast. Listen back to this compelling and intimate performance by Christopher Wood heard on PBS during Global Village, Sunday August 26 from 5pm, with your guest host Garry Havrillay who produced and engineered the original broadcast back in 1988. Included here is a recent Skype interview with Chris. Direct from Greece, Rebetien showcases its authentic Rebetiko sound and will be supported by international and local Rebetiko artists. Immerse yourself in the glorious seaside village of Port Fairy for the 43rd annual Port Fairy Folk Festival happening over the March long weekend. Grampians Music Festival (GMF) is pleased to announce its return in 2019 with the third annual festival taking place from Friday 15 – Sunday 17 February. The Operatives present David Rodigan for his first ever Melbourne show, with the return of Norman Jay MBE plus Brazil’s drum & bass master DJ Marky. PBS 106.7 FM’s blistering live-to-air juggernaut PBS Drive Live returns to the airwaves for its ninth instalment. Performer Drive - Join Now! Join as a performer member during the month of February, and you could win a MASSIVE prize pack! Only one winner takes the lot! The 2019 Bob Marley Day celebration at Seaworks will commemorate 40 years since the Babylon by Bus Tour. Alright you hooners, Freedom Time is back for another New Year’s Day with a face meltingly special line-up.